Notice anything? Anything unusual? You know, besides the little girl with three arms. 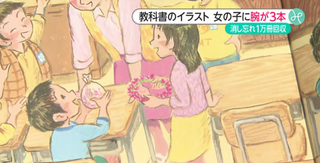 FNN reports that a first grade Japanese text book is being recalled after it was discovered a page in the book featured an illustration of a girl with three hands. According to the publisher, this is the result of the illustration’s under drawing not being properly erased. Around ten thousand of these school books are being recalled in Tokyo and swapped with a new books, sans extra hand.